With Waterslide Decal Paper, you can print any designs using an inkjet printer and transfer them onto any non-porous surfaces. The decal transfer is very thin and barely noticeable when transferred onto a surface. Multipurpose printer paper is versatile and good for most jobs. Features ColorLok® Technology for bolder blacks and vivid colors with inkjet printing. Size: 8 1/2 x 11; Paper Color(s): White; Paper Weight: 24 lb; Sheets Per Unit: 500. With Waterslide Decal Paper you can print any designs using any laser printer and transfer them onto any non-porous surfaces. The decal transfer is very thin and barely noticeable when transferred onto a surface. 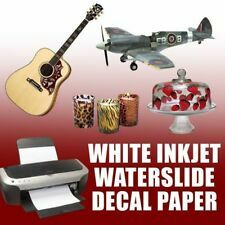 INKJET CLEAR WATERSLIDE Model, Ceramic, Decal Paper 30 sheets 8.5x11. Condition is New. Inkjet Waterslide Decal CLEAR Paper. WaterSlide decal paper for quality image transfers for Inkjet printers. to candles, glass, wood, plastic and other surfaces. 100% Brand new and high quality Ideal for labels, signs, stickers, packaging identification etc. can be used as shipping labels, mailing address labels, Labeling Files and Folders. For Inkjet Printer Only!! Peel and Stick. Self adhesive. 1 Label Per Sheet Color: Clear Transparent Size: A4 Print Temperature: 25°C ~ 30°C Print Setting: Photo mode 10x Clear Transparent Label (A4) Brand Generic MPN Does Not Apply UPC Does Not Apply UPC Does Not Apply. With Waterslide Decal Paper you can print any designs using an inkjet printer and transfer them onto any non-porous surfaces. The decal transfer is very thin and barely noticeable when transferred onto a surface. Why do we love thisPrinter Paper Office Multipurpose Sheets 8.5 x 11 Letter Size Computer White ?. Flat, even surface for consistent ink and toner receptivity. Robert C. Korona Very happy with this paper and the cost was within the budget, more over my printer likes it, feeds well, no jambs, print quality wonderful. We ship from 8 regional warehouses for faster delivery! REAMS PER CASE: 10. SHEETS PER REAM: 500. TOTAL SHEETS PER CASE: 5,000. PAPER COLOR(S): White. PAPER FINISH: Smooth. MACHINE COMPATIBILITY: Inkjet Printers; Laser Printers. PAPER WEIGHT: 20 lb. Use your finger to dip littlewater, then touch the film onboth sides. Thecoating side can make you feelsticky. Blue Screen Tape 3 in x 150 ft ( 100 yard ). White Screen Tape 3 in x 150 ft ( 100 yard ). With Waterslide Decal Paper you can print any designs using any Inkjet printer and transfer them onto any non-porous surfaces. The decal transfer is very thin and barely noticeable when transferred onto a surface. To waterproof must be sprayed with clear coat or overlaid with laminate. Printers: All Desktop Inkjet Printers. • Print straight from your computer to your inkjet printer. • Ten Sheets of 8.5 x 11" Papilio clear vinyl paper, glossy. Page Yield Photo Paper. Our Part Number. Standard thermal print paper for Sony black and white video printers. For use with UP-850MD, UP-870MD, UP-890MD, UP-895MD series, UP-897MD series, and UP898 series black and white thermal printers. 10 roll per box. You will want plenty of this versatile paper to fill your copiers, printers and fax machines. Flat, even surface for consistent ink and toner receptivity. 5,000 total sheets; 500 sheet/reams; 10 reams/case. 6 Rolls Direct Thermal Paper 4x6in. Direct thermal adhesive labels work perfectly with Zebra and Eltron thermal printers. Each label on the roll is made of high-quality thermal paper and a strong adhesive backing. Super quality and easy to use inkjet sticker paper also known as self adhesive paper with a white glossy finish. Create stickers for your car window, window signs, kids creative stickers and cut to size to fit many stickers on one sheet. We strive not only to satisfy your product essentials, but we are also here to inform and assist with all of your POS paper related needs. 3" x Two Ply White / Canary Paper. Micros Printers ; 1700, 2415W, 4000W, 4700, 4700W, 8700, PR282, Heavy Duty Kitchen, PR344, 1700, 2400, 2700, TM-U200B, TM-U300. Use your finger to dip littlewater, then touch the film onboth sides. Thecoating side can make you feelsticky. 17 in x 100 ft. Clear, Milky White. 13 in x 100 ft. 14 in x 100 ft. 24 in x 100 ft. 24 in x 82 ft（3" core）. 2bright white paper with a matte finish. Thickness 10.3 mil. Star Micronics TSP100, SCP700, Star TSP300 Series, Star TSP400 Series, Star TSP500 Series, Star TSP600 Series, Star TSP 654D, Star TSP 700 Series, Star TSP2000 Series. 3-1/8" x 119' THERMAL RECEIPT PAPER. We strive not only to satisfy your product essentials, but we are also here to inform and assist with all of your POS paper related needs. 3 1/8" x 230' THERMAL RECEIPT PAPER. Dare to create proudly permanent, intensely brilliant art on practically any surface with Sharpie Retractable Permanent Markers. Sharpie Fine Point Retractable Permanent Markers. 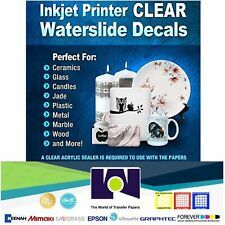 INKJET CLEAR WATERSLIDE Model, Ceramic, Decal Paper 5 sheets 8.5x11. Condition is New. Inkjet Waterslide Decal CLEAR Paper. 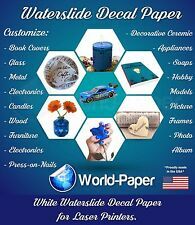 WaterSlide decal paper for quality image transfers for Inkjet printers. 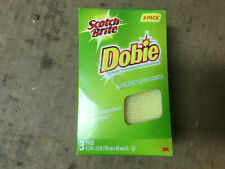 to candles, glass, wood, plastic and other surfaces. Blinggasm waterslide decal paper. made using waterslide decal paper. Instructions for Waterslide decal paper Apply acrylic spray over the decal paper printed by any inkjet printer. This process it is not required for the laser printed paper. 4.5 out of 5 stars - Blinggasm Waterslide Decal Paper, 10 Sheets Clear For Inkjet Printer 8.5" X 11"
2 product ratings2 product ratings - Blinggasm Waterslide Decal Paper, 10 Sheets Clear For Inkjet Printer 8.5" X 11"
25 Sheets One Step Opaque Chroma Cotton ®Paper Transfer. New Compatible Formulated Chroma Cotton ® Transfer Paper One Step Opaque Paper. To transfers on black or dark colored T-Shirt use one-step opaque heat transfer chromacotton specifically paper it is thick white background enough to block out underlying T-shirt color. Fixxons Digital Negative Inkjet Film for Contact Printing 13" x 19"
You'll be able to create dense dark negatives with crisp edges directly from your inkjet printer. It is available in various sizes in both roll and sheet form. Sheets: 8.5" x 11" // 8.5" x 14" // 11" x 17" // 13" x 18" // 13" x 19" // 17" x 22" //. 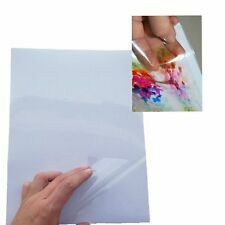 Waterproof Inkjet Transparency Film. Our waterproof inkjet positive film is designed for the silk screen industry. It allows screen printers to print their own film right from their inkjet printer. Microporous waterproof coating technology. ►Smudge Proof. There is no picture on the sheets - The sheets are plain. The "Noah's Ark" picture is to show an example of the clarity of the print out from an inkjet printer. Clear Gloss Inkjet Printer Sticker Paper. 100% cotton rag for archivability. Enhanced 1440 dpi printing for high-quality output. Museum quality, acid-free base to preserve fine art and photos. Bright white surface for excellent color reproduction. HP Printer Paper, BrightWhite24, 8.5 x 11 Paper, Letter Size, 24lb Paper, 97 Bright, 500 Sheets / 1 Ream (203000R), Acid Free Paper. Not all papers are created equal. An extra bright paper formulated to enhance the output of color ink jet printers. Premium Inkjet Printing Transparency Positive Film 5 Mil. Plastic Film Printing. Newspaper Printing. Clothing Fabric Printing. Steel Plate Printing. Glass Printing. Ceramic Printing. Printed Circuit Board PCB. 250 Sheets (5x50) Epson Premium Photo Paper Picture MATTE 8.5 x 11 Double sided. Condition is New. Shipped with USPS Priority Mail. XEROX Vitality 30% Recycled Multipurpose Printer Paper 8 1/2 x 11 White 500 - Sold as 1 Ream. Multipurpose printer paper is good for most jobs. Features ColorLok® Technology for bolder blacks and vivid colors with inkjet printing.